Sweet potatoes are one of my favourite foods - roasted, baked, mashed, made into wedges, blending in soups, cut into chips, etc etc... I just love them! They're so soft & tender when cooked and absorb any flavourings you put with them really well, plus they go with pretty much anything which is always a bonus. Sweet potatoes don't just taste heavenly, they're also amazingly good for you too and are considered one of the worlds healthiest foods. • Sweet potatoes contain a wealth of vitamin A and one average size spud gives you a massive four times your daily dose of the vitamin! Vitamin A is essential for strengthening your immune system, fighting infection and keeping your skin clear and glowing. • Sweet potatoes are high in beta carotene which is the precursor to vitamin A in the body. This will help you fight disease and strengthen your eyesight as well we providing your body with powerful antioxidants that prevent effects of ageing and even diseases such as cancer. Make sure to eat some healthy fats along with your sweet potato to get the full benefits of beta-carotene such as avocado, olive oil or nuts. • Sweet potatoes are a good source of magnesium, which many people are deficient in. Magnesium is an important mineral in the body and helps maintain a healthy heart, strong bones, nerve function and even has anti-stress properties. • Sweet potatoes are high in fibre which is more important than we sometimes realise (more on that here)! This keeps our digestion ticking over nicely, provides your body with energy and helps you feel fuller for longer. 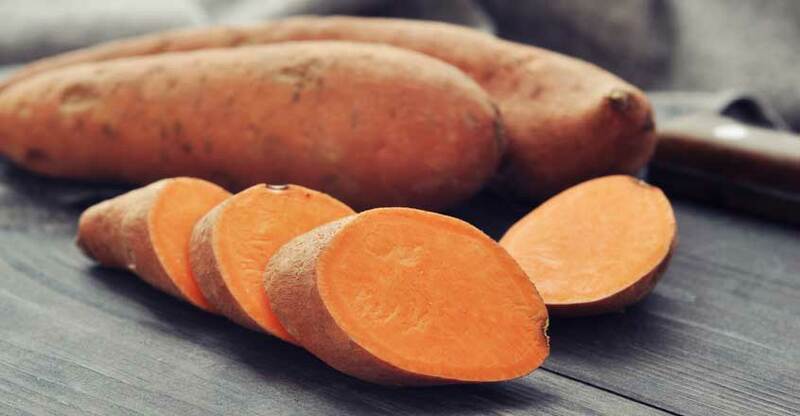 • Sweet potatoes are a source of potassium which is one of the most important electrolytes needed to help regulate heartbeat and nerve signals. Potassium also reduces swelling and controls the activity of the kidneys. On top of all this, sweet potatoes are rich in all sorts of vitamins and minerals such as vitamins C, D and B6 and are low GI which means they won't spike your blood sugar levels! A true superfood!